Fran Enders is now much more comfortable in her mobile home in Newfield, where for the last 20 years she has lived with her husband, Don, and their dog, Lamby. The Enders’ story began when Gibrian Hagood, an educator from Cooperative Extension of Tompkins County, visited her neighborhood sharing information about a program that offered free energy efficiency education. The information shared included learning how to install simple energy improvements like window wraps, LED light bulbs or weatherstripping. Through Gibrian , Fran and Don learned about several free programs that can help homeowners and renters reduce their energy use, including the Weatherization Assistance Program (WAP) and Empower NY, two free federal and state programs which both help seal air leaks, increase insulation, and replace inefficient lighting and appliances. They also learned about the Home Energy Assistance Program (HEAP), which along with help paying for utility bills can help repair and replace heating equipment, and provide air-conditioning for people with certain medical conditions. Gibrian’s assistance made it easy for them to fill out the applications for WAP, Empower NY and an air conditioner through HEAP. Within a few months, Tompkins Community Action, which administers WAP in Tompkins County, had performed an energy audit on their home and outlined what work could be completed within the programs. The list was impressive. 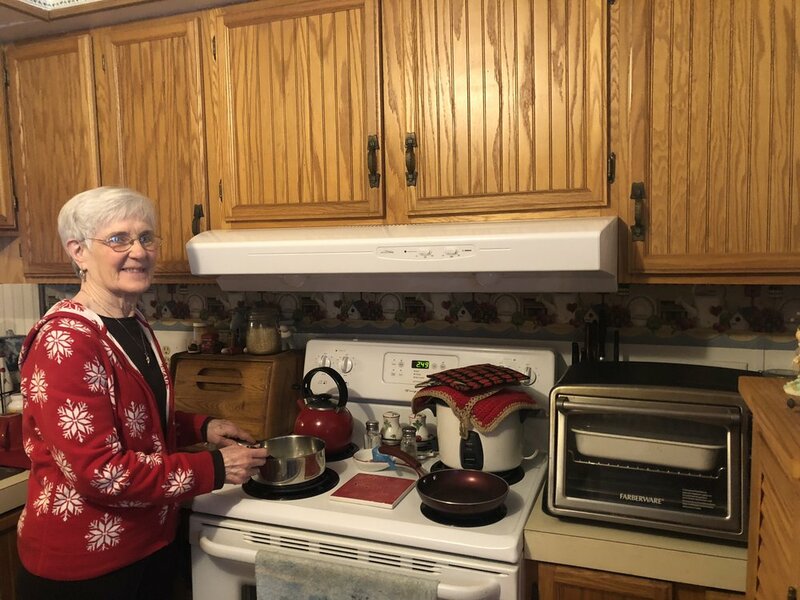 Tompkins Community Action replaced their furnace with a much more efficient model, installed a new refrigerator, hood over the stove, thermostat, and energy-efficient light bulbs, and properly vented the clothes dryer. They also replaced and secured registers in the floors, helped insulate the underside of the floor in their home, and ensured the water heater was working properly. They also qualified for a brand new air conditioner. All of this was free of charge, as the Enders’ were income eligible. She said the process of installation was hassle-free, noting that she recommended that her neighbors check to see if they were also eligible for the program. She added that someone from the program visited their home later to check to make sure everything had been installed properly. Don said it was Fran’s lack of commentary that signified the efficiency and success of the program. “I never heard her complain, so they had to be good,” Don said. Fran also said living in a mobile home can present unique challenges to getting involved in programs like WAP. This is because although she and Don own the mobile home, they rent the lot that the home rests on. She said she found the program to be incredibly inclusive in terms of offering services to many different types of Tompkins County residents. “I don’t know of any other programs when you’re eligible when you own a mobile home,” Fran said. Fran said that since the work was done, their home is significantly warmer than it was before. Fran thinks that the work done will also significantly lower her heating costs, but hasn’t seen a bill yet since they receive HEAP, which helps them pay for their home heating costs. Her next bill will be in March, however, and she thinks the savings will be reflected there. Learn more about energy efficiency programs and how to apply here. To request help with free Energy Advising, contact Karim Beers, Get Your GreenBack Tompkins coordinator, at kwb6@cornell.edu, or call (607) 272-2292 x186.